Normally I’m not a huge fan of New Year’s Resolutions. It’s hard for a resolution not to come across as superficial or fleeting, tossed around as a conversation piece or to give someone a false sense of hope that this is the moment when everything is about to change: your whole world can improve this year if only you make it your Resolution to do so (whether “doing so” entails losing weight, eating better, opening your heart to love, scrapbooking every day). Often people seem to quickly develop love-hate relationships with their NYRs, sometimes even before that relationship has begun. In December a person is already thinking about THE LIST, but likely already they’re considering the odds of whether they’ll follow through. Or whether they’ll even remember their list past January 3rd. Self-assessment and goal-setting are two of the most critical activities a person can and should engage in, in my opinion, so why is it New Year’s Resolutions have always been something I scoff at and dismiss? Could it be that I have also developed a love-hate relationship with NYRs, which has manifested in my inability to even acknowledge them? Could be. Or maybe it’s just my own little way of rebelling against the status quo by refusing to join the global chorus of Resolution(s) proclamation on the 1st of each year. This year, though, seeing as we are now entering into the Age of Aquarius, and Hollywood has conflated the Mayan calendar to make sure all humanity knows this may very well be our last year on Earth, and given that I am now one quarter of one century old, it seemed like a good time to re-evaluate my relationship with resolutions. So this year, in addition to some serious self-evaluation and a handful of small and big goals, I’ve resolved in 2012 to post to my blog once a week. A post a week in 2012. There. It’s been typed out loud. The entire Internet and all 12 of my blog readers now know that I have set this resolution. Dang, the pressure’s on now! Recipe adapted from Having Fun in the Kitchen! Spread aluminum foil (about 10 inches worth) onto a baking sheet and lightly oil. Roll out the pastry on a well-floured surface. I rolled mine to about 8inx8in but you can make yours longer or wider, depending on how much dough and how big of a tart you want to make. Trim the edges of the crust so it’s a little bit bigger than the size you want, and gently transfer to the foil (an easy way to do this is to delicately fold in half and half again, then unfold once on the foil). Fold the edges up over the crust to create a raised edge (to catch the fruit juices when it cooks). Fold the overhanging ends of aluminum foil upward, so they will catch any juices that flow out. Place the whole cookie sheet in your fridge (hopefully all of your holiday leftovers are cleared out by now and you have room). Peel the kiwis and slice them about 1/8 inch thick. Peel the apple and cut in half through the stem. Remove stem and core and slice crosswise into 1/8 inch thick slices. Make sure you do the kiwi first, otherwise the apple will turn brown if left to sit too long. Remove the chilled dough from the fridge. 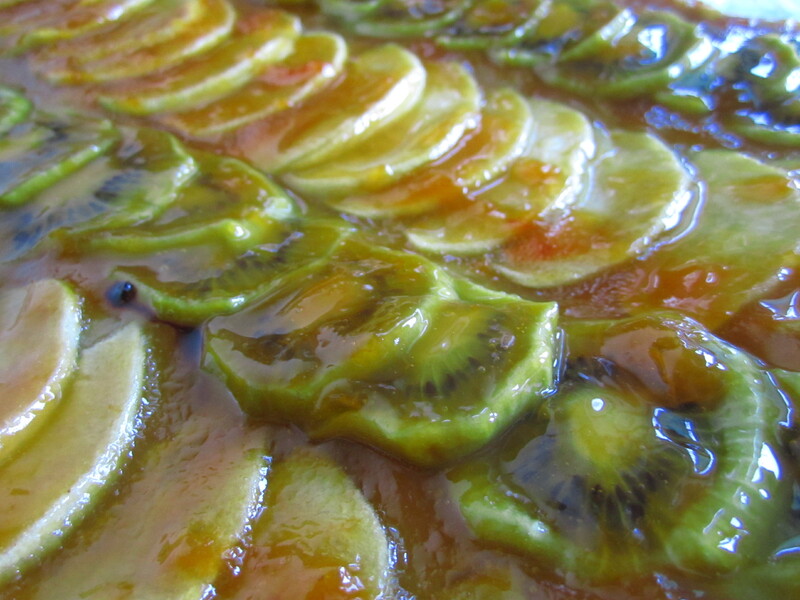 Place the apples and kiwis in alternating rows so each slice slightly overlaps. The fruit will shrink when it bakes, so I recommend squeezing them in as much as you can. Sprinkle the sugar so it evenly coats the fruit. Place in the over and bake for 45 minutes to an hour, until the pastry is golden and the edges of the apples start to brown. Rotate once about halfway through (to promote more even baking). 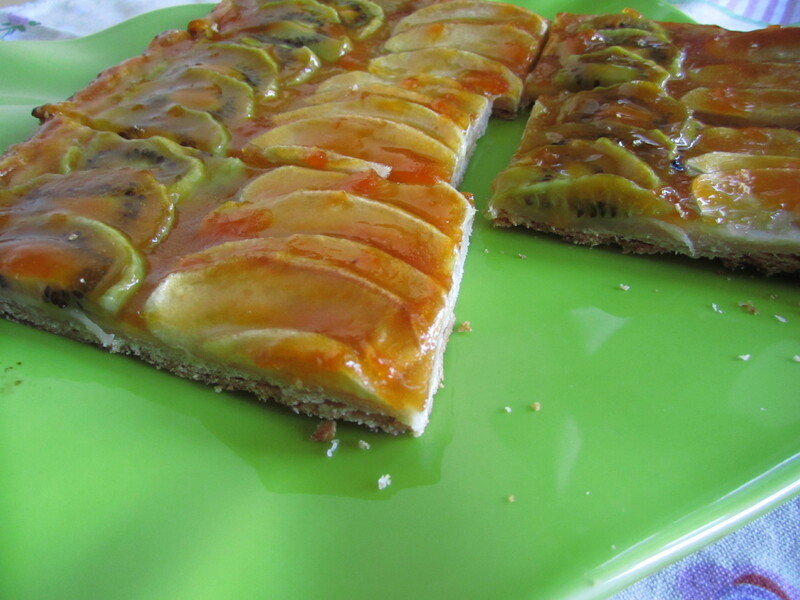 When the tart is removed, warm the apricot jam (microwave or stove top both work), then brush evenly and generously over the entire tart, filling in all the crevices. Use a metal spatula to loosen the tart from the foil. This is when I had a minor freak-out moment, since charred sugary fruit juice and hardened to the crust and the foil, making it almost impossible to break it free. I managed somehow, but not without almost destroying the tart. I recommend maybe letting it cool a bit before ripping/scraping the foil off if it’s not coming easily at first. (Or try one of the two methods I give above to eliminate juicy overflow). Let cool before cutting and serving. Tip: a pizza cutter is a great way to slice it. 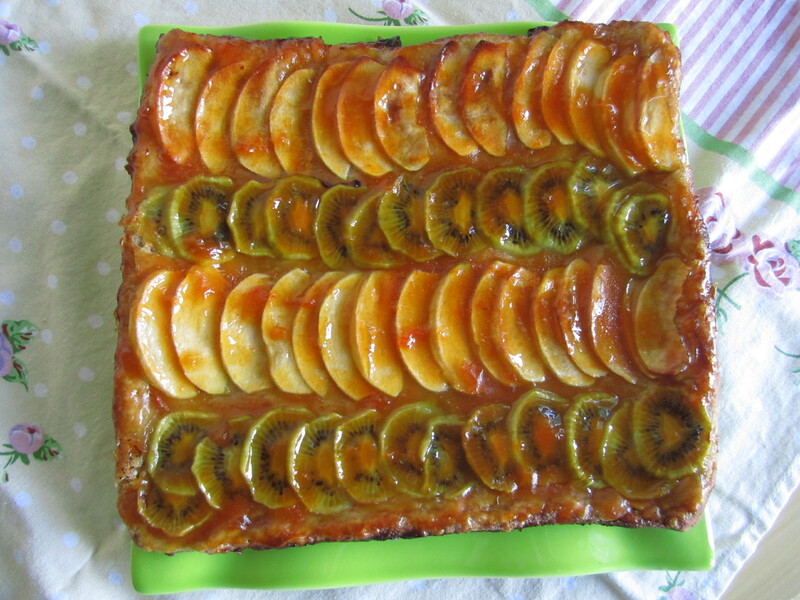 This entry was posted in Not pie, Vegan and tagged apple, kiwi, tart, vegan. Bookmark the permalink.